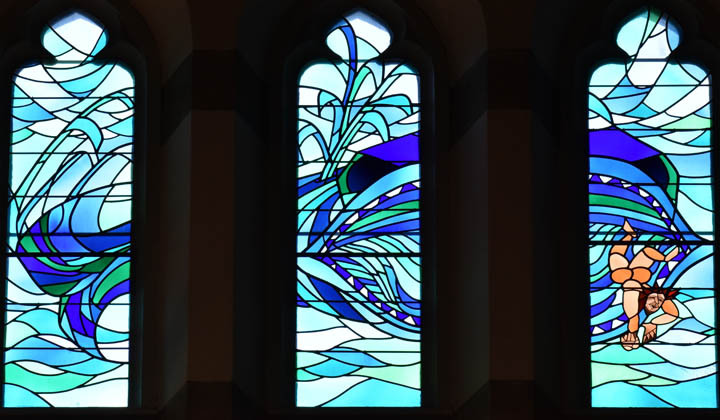 In the Jonah Window the dramatic moment of the release of Jonah from the belly of the whale is recounted. Like Christ (who was buried for three days, and then rose), Jonah was spewed forth onto dry land after three days and three nights in his watery prison. Indeed, one can see a deeper significance: Jonah was thrown overboard during the violent storm to save the lives of the other men aboard: Christ was the one slain for the many. (It is better that one should die for the multitude..."). Jonah 1:17 The Lord appointed a great fish to swallow up Jonah; and Jonah was in the belly of the fish three days and three nights. Jonah 2:10 The Lord spoke to the fish, and it vomited out Jonah upon the dry land.